Split Rock Lighthouse is one of the few lighthouses left in the world that has the original clockworks in place. The clockworks is similar in concept to a giagantic grandfather clock. There is a large counterweight that drops down the center of the tower. This falling weight causes the clockworks to spin, which after going through a series of gears causes the lens of the lighthouse to rotate. 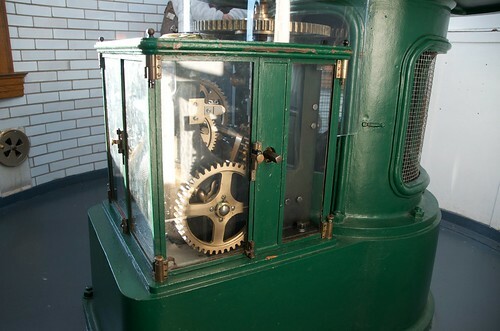 In most lighthouses the clockworks has been replaced with an electric motor.